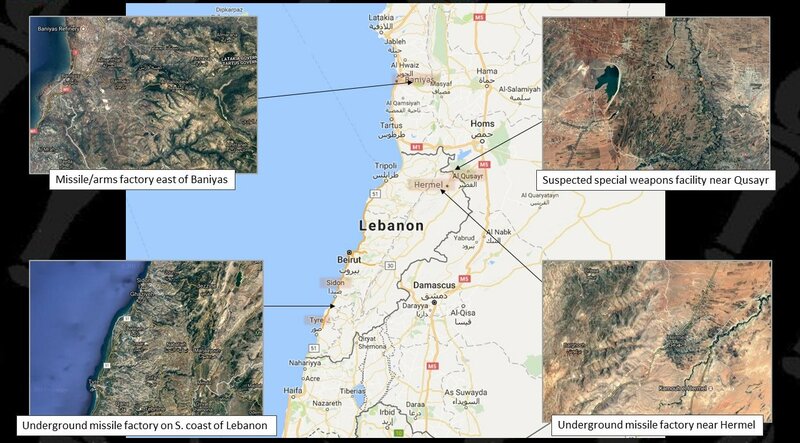 The underground complex is located near Al-Qardaha – Assad’s birthplace and the ancestral home of his Alawite clan – in the coastal mountains of Latakia province. (Maps and images below.) North Korea has reportedly been involved in developing the site since 2011, when construction was first observed there, apparently of the structure that houses the tunnel complex entrance. The images at this report from Zaman Al-Wasl show the site in 2011 and 2018. The site of the facility is easily located just south of Al-Qardaha, and is shown in relation to the town in the first satellite image below. The structure abutting the slope (the multilevel building on the right) is oriented to give access to a tunnel complex entrance facing the south. Other features are annotated on the second, zoomed-in image. There is a security fence visible on the west end of the site, where the guard gate regulates traffic from the main road running down the western side of it. But the surrounding area is interesting, partly because of the apparently minimal security features. Of particular note is the group of dirt back-roads that appear to be easily accessible, connecting to the site identified in the Zaman Al-Wasl report. If the back-road running from that main site (on the eastern end) is followed to the northeast and southeast, it leads to three areas where there appears to have been a history of disturbed earth, and possible grading. However, unlike most of the area that apparently covers the tunnel complex to the south, as well as the rest of the surrounding terrain, these three areas are not under agricultural cultivation. We can’t be sure what this means without comparing imagery of them over time, but seeing these areas raises the question whether the tunnel complex is in fact quite large. These may have been auxiliary locations for preparing ventilation, inserting equipment, or other activities related to the main entry site. 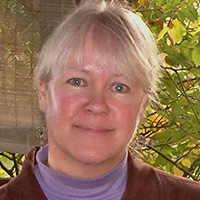 Without more research, an assessment of the site’s full scope can’t be made. 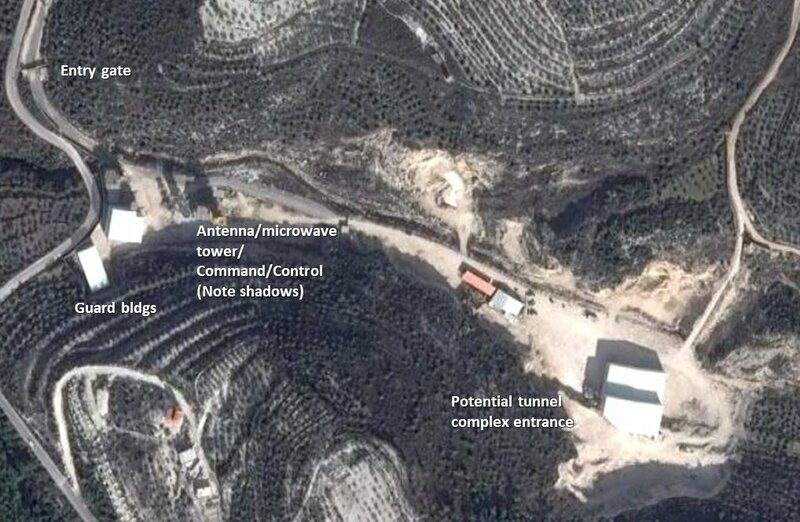 But it would be feasible and likely for the tunnel complex to be large, given the recent history of other construction for underground weapons facilities in northwestern Syria and Lebanon. The location would also be a likely one for such an enterprise. The most obvious point is that it is immediately adjacent to Al-Qardaha, the home base of Assad and his clan. 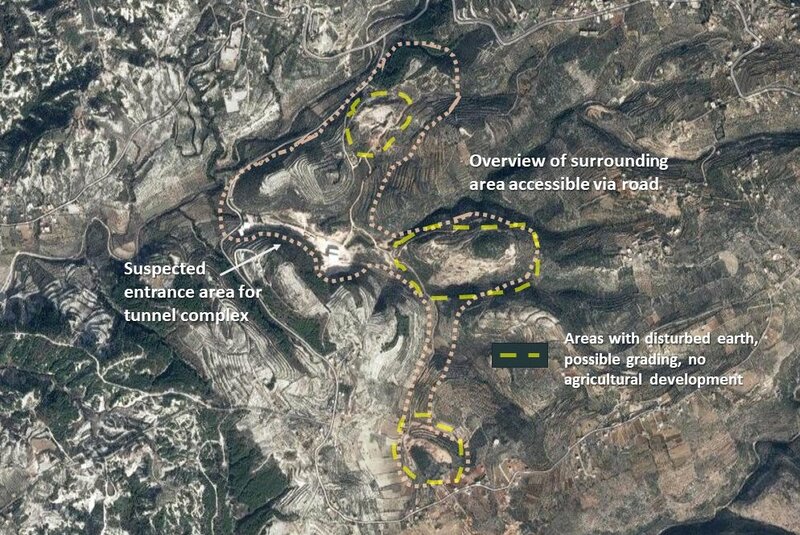 In some ways, as a mountain stronghold (as well as an underground facility), it is more defensible than special weapons facilities near Damascus and Aleppo. These considerations would have been important at the outset, in 2011. But as Russian involvement grew, especially after the middle of 2015, the significance of Al-Qardaha’s location in Latakia province became greater. Russia’s presence off the coast, with warships on patrol, means that maritime deliveries have a greater chance of getting through. Being located close to the port of Latakia (about 20 miles away) becomes a greater advantage. Even if Israel, for example, gains knowledge of an arriving shipment, cargo can be moved so quickly – over roads that are under no significant threat from rebel forces – that Israel may have no time to react. 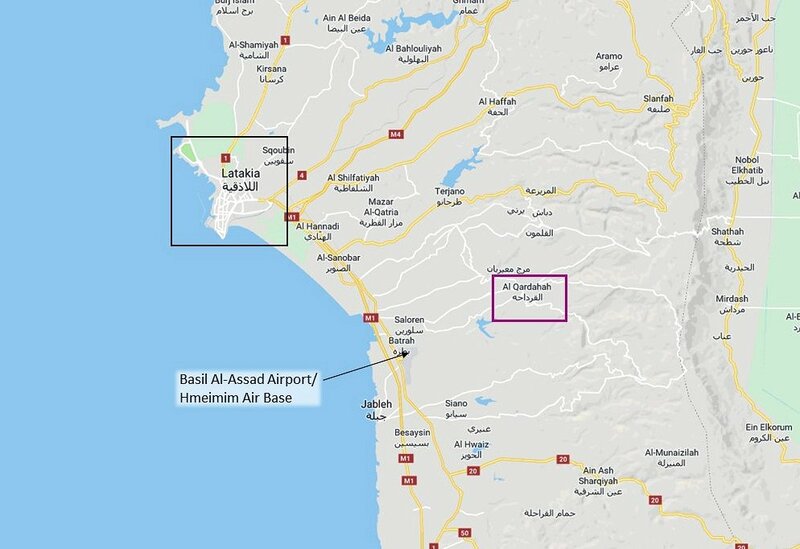 Similarly, being situated less than 10 miles from Basil Al-Assad Airport, which is co-located with Hmeimim Airbase, is a major advantage. Aside from the ability to move cargo through the commercial side, Hmeimim hosts the Russian air force assets in Syria, and is protected by a multilayered air defense network operated by the Russians. The umbrella of Russia’s S-400 air defense system, as well as of shorter-range point-defense missile assets, fully covers Al-Qardaha. As recently as 2017, according to the UN, shipments from the Kim regime were intercepted on their way to Syria. 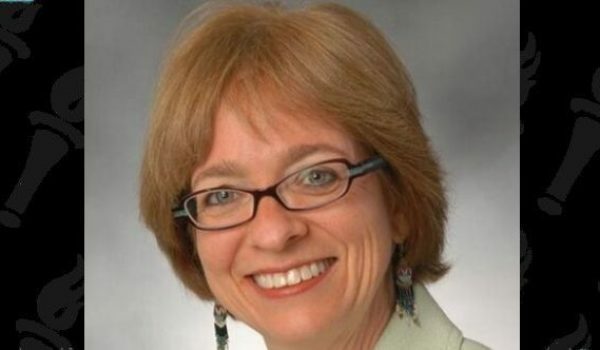 Two were intercepted last year; we don’t know how many may have successfully gotten through. There’s more than one way to move specialty cargo from North Korea to Syria; much of it can go by air via Iran, with limited exposure to potential inspection at initial stops in China or the Russian Far East. [E]xperts told the [New York] Times that [the UN report] laid out in unprecedented detail the sophisticated measures these countries have taken to get around these sanctions. The report describes some of North Korea’s methods of sanctions evasion, which include a complex web of shell companies, a network of sympathetic individuals in unnamed foreign countries who provide access to financing, the use of its own diplomats to carry out smuggling, and cyber operations. The use of the shell companies, in particular, would be designed to mask the origin and ultimate destination of the cargo, and minimize suspicions as to its nature, so that at least some of it could basically travel in the open. 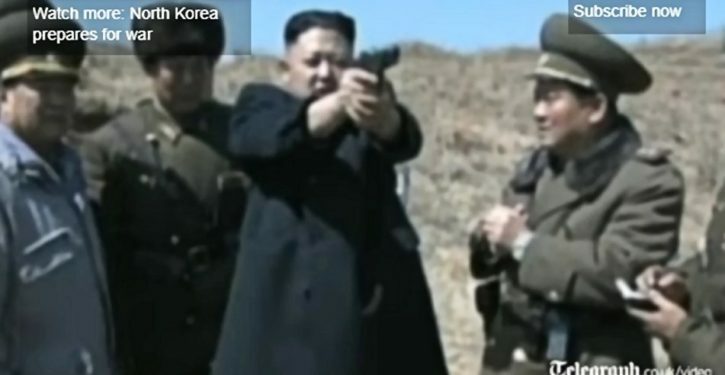 Moving prohibited arms cargo is one thing; North Korea also has (see links above) a long history of supporting Syria’s missile and special weapons programs. The relevant facilities for those programs are located in the corridor running from Damascus to Aleppo. And it was North Korea, of course, that was building the plutonium reactor in eastern Syria at Al-Khibar, which Israel struck in September 2007. This history of cooperation in construction and manufacturing increases the likelihood and credibility of reports about North Korea assisting in the tunnel development at Al-Qardaha. North Korea has participated in tunneling projects in Iran as well. But there’s an additional dimension of North Korean involvement that puts the recent report about Al-Qardaha in a very interesting light. That’s the persistent reporting about North Korean military advisers and special forces participating in combat in Syria. For the subject of this post, however, the most significant report is that North Koreans participated in the battle of Qusayr, in northwestern Syria on the border with Lebanon, in 2013. 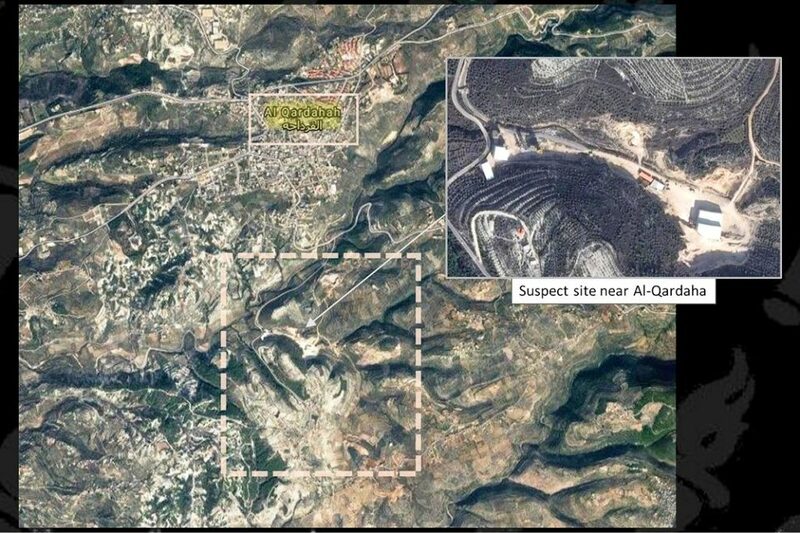 Qusayr is a nexus point in the growing network of Iranian-backed weapons facilities in western Syria and Lebanon, something that stands out in even stronger relief when the element of North Korean involvement is added. 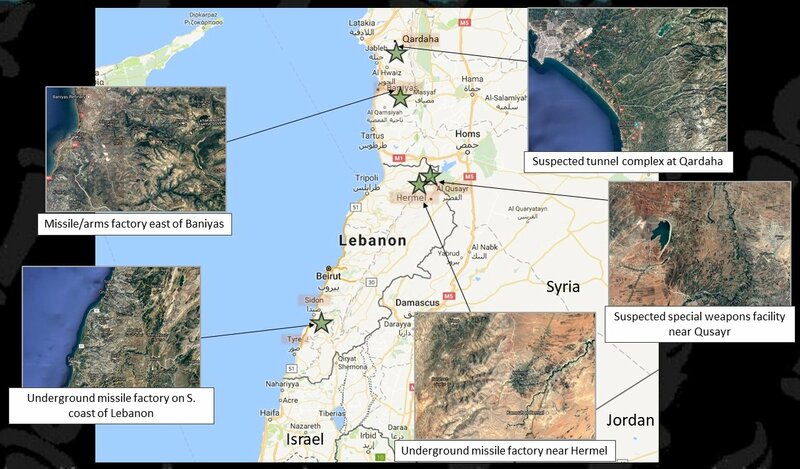 I posted a summary in August 2017 of the Iran-backed weapons facility network being developed in western Syria and Lebanon. At the time, there were four facilities identified, as seen on the map here. One of those was near Qusayr. It was of special interest in part because the initial public reporting of it (just before January 2015) suggested a connection with the remnants of the North Korean-sponsored nuclear reactor in Al-Khibar. The timing of the battle of Qusayr, and of combat events near Damascus – where surviving components of the plutonium reactor were thought to be stored – suggested that the apparent underground development near Qusayr may have at least originally been a destination for relocated reactor components. But the combination of factors at Qusayr, at Al-Qardaha, and in the rest of the weapons-facility network solidifies an increasingly illuminating overall picture. As developed in my August 2017 article, the Iran-sponsored array of weapons facilities in this area has several important similarities to Iran’s own giant complex east of Tehran, which includes the installations at Parchin and Khojir. And the sum of the reporting on North Korean involvement suggests that that involvement probably extends to all of them. In other words, Iran and North Korea are both participating in the creation of a weapons facility complex in western Syria and Lebanon. The original sponsors of the Al-Khibar reactor were probably there all along, from the start of the Syrian civil war, and could have had as much input into the movement of remaining reactor components around western Syria as Iran or Assad did. It’s certainly possible that the components (thought to include some fuel rods, and equipment related to uranium conversion) ended up at Al-Qardaha, although we can’t prove that from information available to the public. The comment of U.S. officials is significant, however. I wouldn’t expect them to say the word “nuclear” in connection with Al-Qardaha lightly. What an interesting time, therefore, for Kim Jong-Un to want to talk to President Trump. A number of analysts have been making the case for years that the links between Iran and North Korea have to be considered integral to any strategic approach by the U.S. to Iran’s nuclear program. The converse is also the case. It could be seen as daunting that Kim has arranged to have a stake in a special weapons complex in Latakia province, currently snuggled under the coastal mountain range and a Russian air defense umbrella. But there’s another way to look at it. The broader payoff from putting that stake in play with U.S-Kim negotiations – including what it would take to put the stake in jeopardy for Kim – has just jumped to a new level. Levers come from a lot of places; fulcrums that serve multiple purposes are gold nuggets, and rarely as handy. It looks like Trump has just found one. * Note: a unique aspect of the battle of Qusayr, in 2013 and the consolidation period afterward, was the primary involvement in it by Hezbollah. But North Korea has been working directly with Hezbollah for a number of years as well as with Iran, both supplying weapons and performing adjunct roles in Hezbollah’s paramilitary operations. (See especially the Bechtol article (PDF) from 2015 and Johns Hopkins 38North article from 2013.) If the North Koreans assisted Hezbollah in the battle of Qusayr, that broadens the illumination of what’s been going on, not only from the standpoint of who’s been involved, but what it’s all for.